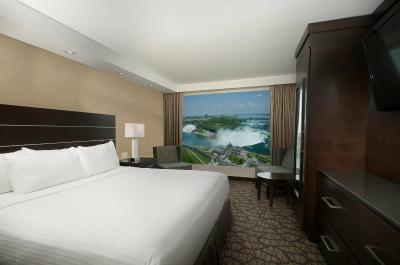 Lock in a great price for Embassy Suites by Hilton Niagara Falls/ Fallsview – rated 8 by recent guests! 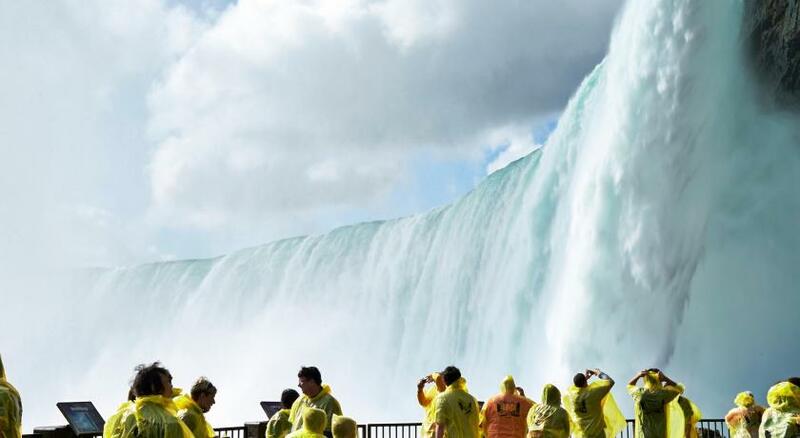 Awesome location right across from the Canadian Horseshoe Falls!! About a mile walk to view the US Falls. Lots of restaurants close and a mall as well. The main downtown area is across from the US falls- like Coney Island! So much to see and do and eat! We chose to Uber and it cost about $10 CA each way :) When we checked in they took our car and parked it off site, so plan on not using your car. Breakfast was nutso! Sooo many people and pretty long waits to get through buffet line. Tons of choices though and plenty of seating. Staff was unbelievably friendly the entire trip! Great hotel- pay extra to get the falls view! Totally worth it! The breakfast was subpar. We only went one time, because it just did not meet our expectations. Everyone at resversation desk was great.enjoyed restaurant and room. 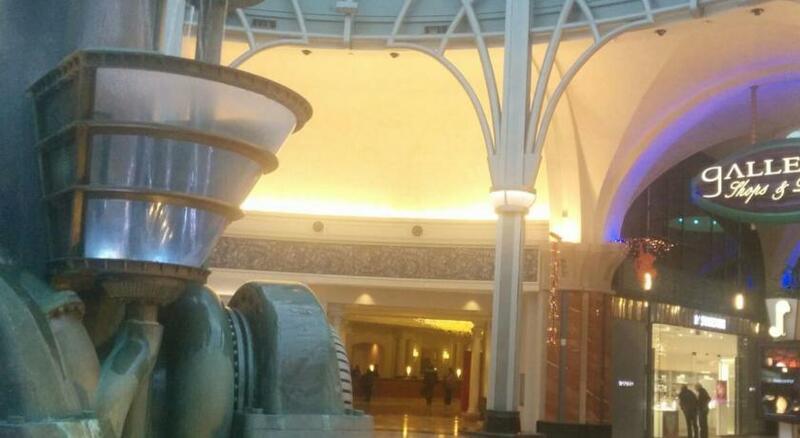 I enjoyed the hotel. We had a perfect view of the Canadian Falls from our room. The breakfast was great and the Steakhouse was very good. Very good breakfast and the rooms were clean and spacious. Breakfast was always pleasant, although busy at many times. Embassy Suites by Hilton Niagara Falls/ Fallsview This rating is a reflection of how the property compares to the industry standard when it comes to price, facilities and services available. It's based on a self-evaluation by the property. Use this rating to help choose your stay! 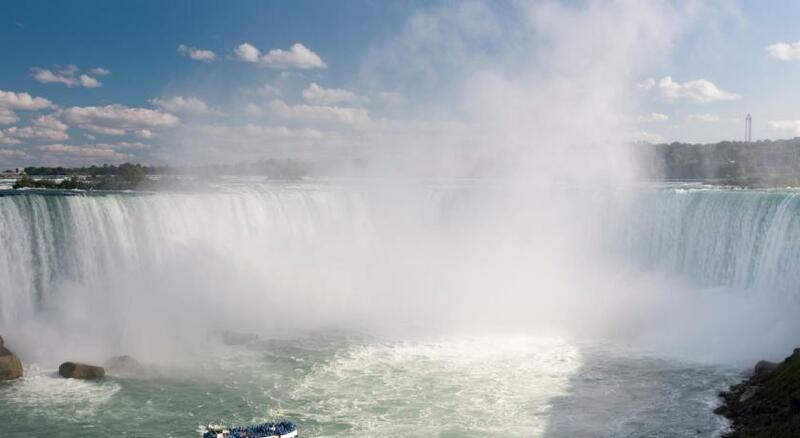 One of our top picks in Niagara Falls.The Embassy Suites by Hilton Niagara Falls Fallsview is an all luxury suites Hotel and only a hundred yards away from brink of the Falls. It offers spacious two room suites with a separate living room and bedroom. Also included with every stay is our full buffet cooked-to-order breakfast, as well as our evening reception including alcoholic beverages, and free snacks. 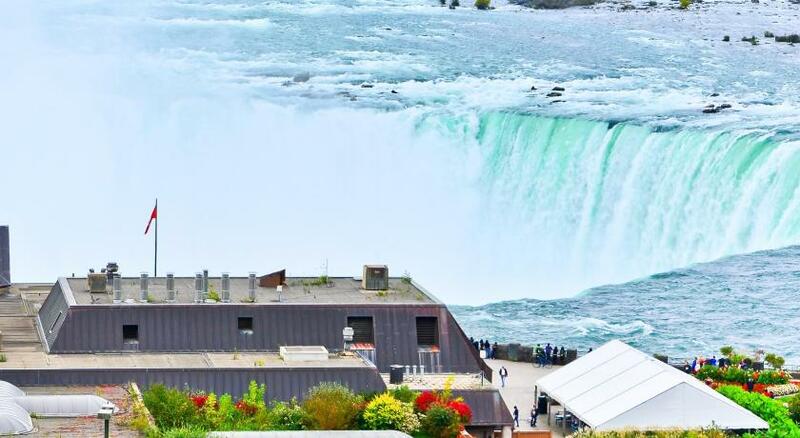 Next to the Niagara Fallsview Casino Resort, this hotel features spectacular panoramic views of both the American & Canadian Falls. 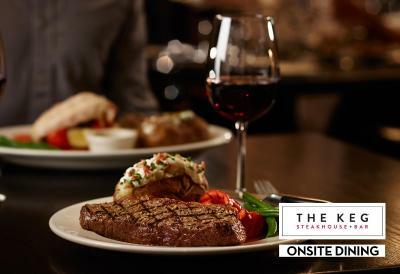 It has an on-site TGI Fridays Restaurant and Sports Bar; it offers Fallsview dining at Keg Steakhouse + Bar, and a on-site Starbucks Coffee location. Guests can work out in the Embassy Suites’ on-site gym or relax in the hot tub, or have a swim in our indoor pool. 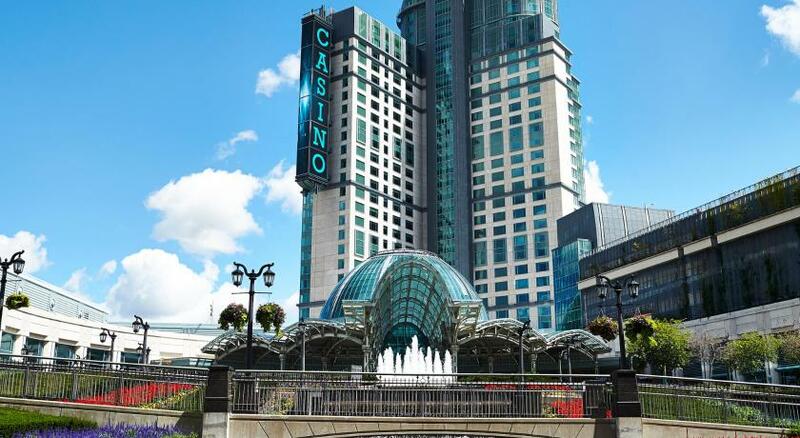 Casino Niagara is less than one mile from the Fallsview Niagara Falls Embassy Suites. The Skylon Observation Tower is a 10 minute walk from the hotel. 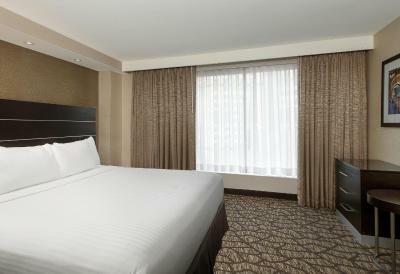 When would you like to stay at Embassy Suites by Hilton Niagara Falls/ Fallsview? Rates are based on 2. Maximum occupancy in the room is 7. Please refer to hotel policies for additional charges. Rates are based on 2 guests. A maximum of 5 guests can stay in this suite. Please refer to the policies for fees that will apply for additional guests. 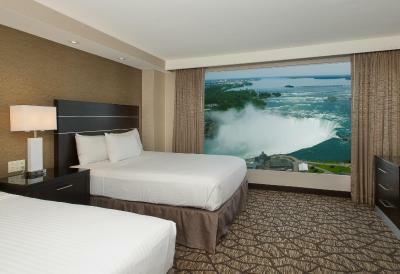 This room offers a view of both the Horseshoe Falls and the US Falls. Please note that the room rate is based on 2 guests. Maximum occupancy is 12 guests (see Hotel Policies for extra person charges). This suite features a microwave, air conditioning and flat-screen TV. This suite has a flat-screen TV, microwave and air conditioning. 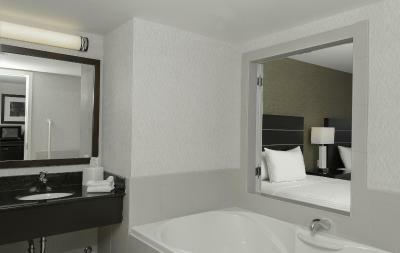 This suite features panoramic views of both falls. 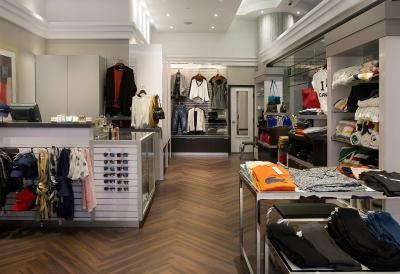 It also includes a cooked-to-order breakfast and a complimentary evening reception. 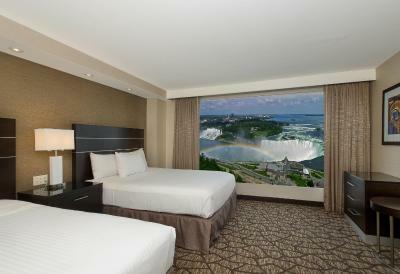 Embassy Suites By Hilton Niagara Falls - Fallsview Hotel boasts 565 two-room suites. 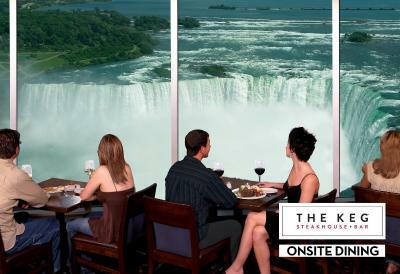 The hotel towers 42 storeys over the Brink of Niagara Falls - and is located only 100 yards from the water's edge. WiFi is available in all areas and costs CAD 16.95 per 24 hours. House Rules Embassy Suites by Hilton Niagara Falls/ Fallsview takes special requests – add in the next step! Embassy Suites by Hilton Niagara Falls&#47; Fallsview accepts these cards and reserves the right to temporarily hold an amount prior to arrival. Embassy Suites by Hilton Niagara Falls/ Fallsview accepts these cards and reserves the right to temporarily hold an amount prior to arrival. Please note that a surcharge applies for payments with foreign currency. Service animals are allowed, please inform the hotel in advance. All extra beds are subject to availability and not guaranteed. Arrangements for extra beds must be made in advance. the breakfast was not suitableness to the hotel level and the price. With this reputation of the hotel you still charge for wifi? 9 dollar put people off is this really worth? Think about it management. I booked your hotel bcs you have a amazing breakfast. I do not understand with such little variety and shabby setting of the place. The parking was expensive and there are two levels of parking. One was paid with your car being parked off site, where when you wanted it you had to board a shuttle to get it and then there was full valet. (which was even more money) The difference was not explained on check in and I only found out when I wanted my car for check out. The hotel was right next to the casino which made it feel more suited to an adult crowd. Vallet parking is a big scam. They charge you $60 to park your car but when you want your car back, they make you get on a bus and drive you 5km away in an open parking lot and drop you off by your car. It was rainy and freezing cold with a baby and many bags. It was the most terrible service they give. Pillows weren’t fluffy, vending machine took a token without giving me a drink so I had to go to Starbucks and pay a lot for a drink, and the rest of the tokens wouldn’t take, i paid almost $500 for a night expecting to be higher then the 16th floor to have a great view, the a/c wouldn’t work in the room so it was hot all day and night, to make things even more horrible the fire alarm was going off while we were trying to sleep. Being a business owner myself I take pride in making sure my customers are happy and what we experienced made me not want to go back there again or recommend staying there to anyone. The breakfast missing vegetables, also no cheese. They pre authorized C$ 300 for three nights, and this is not mentioned while reservation? And for no reason? They told me after check out they will return the money within 3 to 5 days ??? Otherwise within 1 month?? Having to pay for parking while spending so much for the hotel. Our view from our room was spectacular! Breakfast quality was not great and staff at breakfast were yelling at customers on how to use buffet repeatedly, which was a irritating through the meal. Different elevator banks to access different floors was confusing and created long waits for some elevators. Additional costs - Parking was shockingly expensive ($60 per night). Take note that there is an additional 10% fee (above taxes) on everything - food, parking, room rates - charged by the hotel as a "service fee" (many other businesses in Niagara Falls call this fee as a "tourism tax"). It is my understanding that these fees are the discretion of the business. 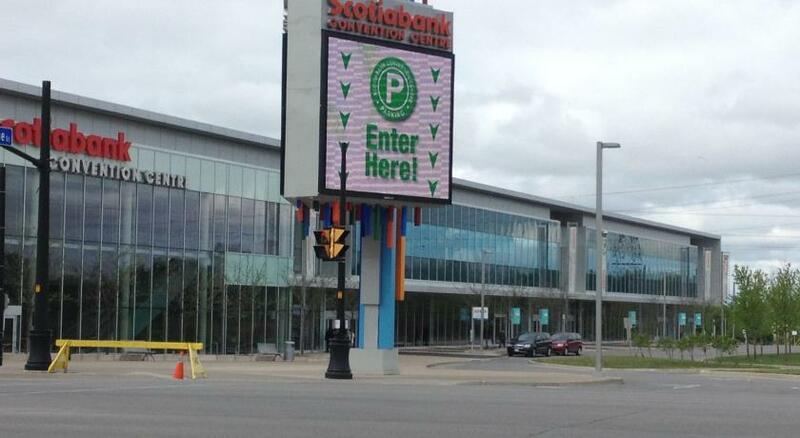 Location was convenient to the convention centre / Falls. Staff accommodated rooms together for our party with an unexpected upgrade. Layout of the rooms with three queen beds (rather than two and sofa) was odd but convenient for our group. Complimentary breakfast and happy hour was very nice, especially with high costs of everything in Niagara Falls. Keg in the hotel is convenient. The only thing I didn't like was the fee for watching cartoon in my room which I wasn't aware of it and my nephew watched it and of course he wouldn't realize its not for free. I think they should tell the guest from beginning . I really like the place. The place was amazing and we got 4 voucher to fun house.free snack and 2 drink came with our room which was nice.The staff were polite and helpful and rooms were very clean. The breakfast was very good and had a very beautiful view of falls when having breakfast.